The concept of money ultimately boils down to trade. It’s a behavior as human as eating or breathing. We now have a wealth of options when we want to spend and send money, but it didn’t start out that way. It was a long ride from swapping livestock to mining Bitcoin. 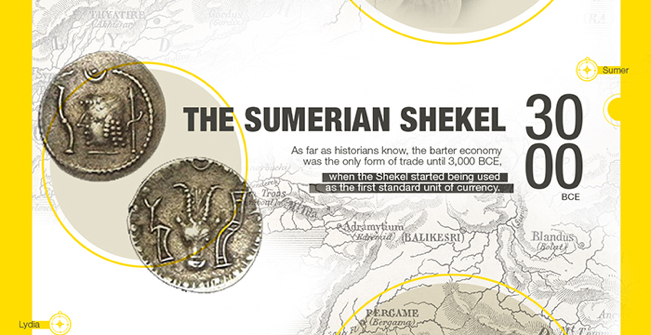 Check out the major milestones that shaped the history of money. Discover more about emerging payment trends, global spending habits, and the changing payment landscape on our interactive journey through the future of money. of moneyHow did we get here? Money as we know it today started to take shape around 600 BCE, when the Lydian government minted gold and silver coins to create the first national currency. The song Dynasty printed the first paper money. Backed by goldm silver and silk, paper currency was lighter and more convenient to carry. In the Middle Ages, the concepts of banking and commercialized debt emerged. While lending occured throughout history, Italien merchants started turning a profit by financing the sea voyages of other traders. The Industrial Revolution allowed people and ideas to move more freely. The movement of money wasn't far behind. After the industrial revolution, Western Union's money wires made it faster and easier to send money across the world. Lending took on a new, more convenient form when the Diner's Club began issuing credit cards that could be used at multiple locations, unlike the single-store cards before them. The advent of the Internet bred digital payments like online wire transfers and e-commerce, and in the last 20 years, our phones have become extensions of our wallets. Even to this day, money continues to evolve. In 2008, anonymous coders released Bitcoin, the first decentralized virtual currency on the internet.